I'm just starting to get in to web development. I'm learning Rails at the moment. I have lots of experience with various programming languages. 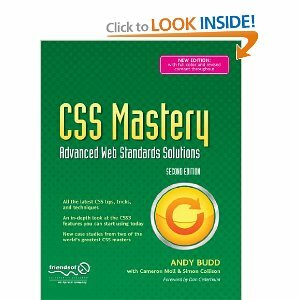 I've been searching for books to help me get started; I want to focus on writing clean, standards-compliant HTML and CSS. Does anyone know of any modern, standards-based resources I can use, particularly books? It's written by some of the most influential CSS experts from the last several years. I've found that trying to duplicate existing site designs is a great way to learn graphics and CSS techniques. For instance, sites like http://microsoft.com and http://www.mozilla.com/en-US/ are built around software products, but both do things a little differently. Understanding what is going on here, as well as the audience they are trying to reach will help you as well. Find a site you like and see how well you can duplicate it. Also, for CSS practice http://csszengarden.com is nice and follows the advice above. Not the answer you're looking for? Browse other questions tagged learning books coding html resources or ask your own question. If you had to go back and re-learn your skill set, how would you do it? Is “PHP and MySQL Web Development, 4th ed.” an outdated book to learn from?